Irish grid reference: O2112 4208. The holy well is located behind the church of St Doolagh to the north of Dublin and just off the R107 Malahide road at Balgriffin. The area known as Balgriffin is a small part of Malahide, one and half miles to the north – Malhaide itself being a suburb of Dublin city. St Doolagh’s parish church dates in part from the 12th century when it was an Augustinian abbey, but there was a church on the site back in the 7th century AD – at which time it is thought that St Doolagh or Doulagh lived as a hermit here. He is, however, a largerly forgotten saint and nothing much is known about him. He may have been a disciple of St Finian and, in later life became a bishop. His feast day 17th November is still celebrated here at Balgriffin where his holy well can be found in a sunken area behind the church surrounded by trees; and a rather nice well it is too. In fact there are two holy wells here. The main holy well, St Doolagh’s, is located inside a small hexagonal-shaped well-house that has a pointed roof and two narrow windows at the back, one shaped like a cross, while at the front above the entrance door another narrow window. The building actually taking on the look of a small chapel or baptistry. Here the spring of water issues from what may originally have been a font, and then outside into a square-shaped baptismal pool or bath that has some steps ascending downwards. The well-house stands in a sunken area that is surrounded by low walls and, at the pool-side end, there are stone seats running around these walls for the benefit of pilgrims. On the saint’s feast-day 17th November pilgrims still come here hoping for a miraculous cure through the healing waters. At certain times the sunken area around the well-house is submerged in water forming a much larger bathing pool. A short distance from the main well-house down some steps is yet another well. Yes there are two wells here. This building is octagonal-shaped and has an arched doorway with a narrow window above that. The spring called St Catherine’s well (St Catherine’s Pond) is located inside the little building. 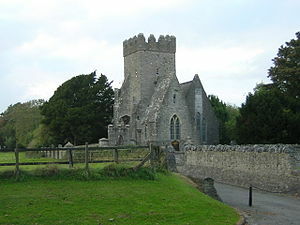 This well-house, like St Doolagh’s, is similar in design, and has also been a place of pilgrimage since at least the middle-ages, if not before that. Inside the small, partly restored church there is a hermit’s cell where the low window is located and, also a penitents’ cell (not sure what the difference is). Also what is considered by some authorities to be the actual tomb of St Doolagh. Just down the lane stands a small cross on a modern, stepped base. This is shaped like a letter “T” and is probably one of only a very few tau crosses in Southern Ireland, dating from the early medieval period. Categories: Holy Wells, St Doolagh's Holy Well Balgriffin Co Dublin | Tags: St Doolagh's Holy Well at Balgriffin in Co. Dublin | Permalink. Wish we knew more about the hermit!